Input paper tray must hold a ream (500 sheets, Wiki) of 8-1/2 x 11" letter paper. 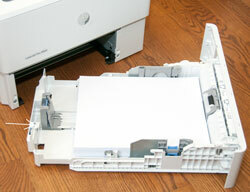 duplex printing (both sides of the paper) - this cuts down drastically on the paper input. There were some nice features on the printers I considered but gave up on in order to get those above: photo quality, ability to handle larger paper sizes like 11x17, built-in WiFi (the M501 only has USB and LAN connectivity), lower price (there were many printers in the below $100 area, but none of them had the key spces). HP Support page for the M501. 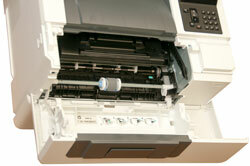 This printer is about an inch shorter than the 4050N where both have the same paper capacity. They both support an additional paper tray on the bottom. 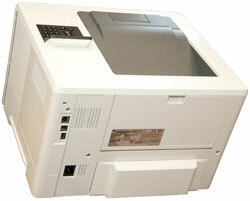 F2A72A is the HP model number of the optional 550 sheet paper tray. The manual paper feed and the paper tray are supposed to accept 3x5 cards, to be tested. Blue plastic parts are manual release levers and should be used rather than forcing a change. The first time the printer was powered up the menu offered a few defaults, which I took. But to finish I needed to load some paper. 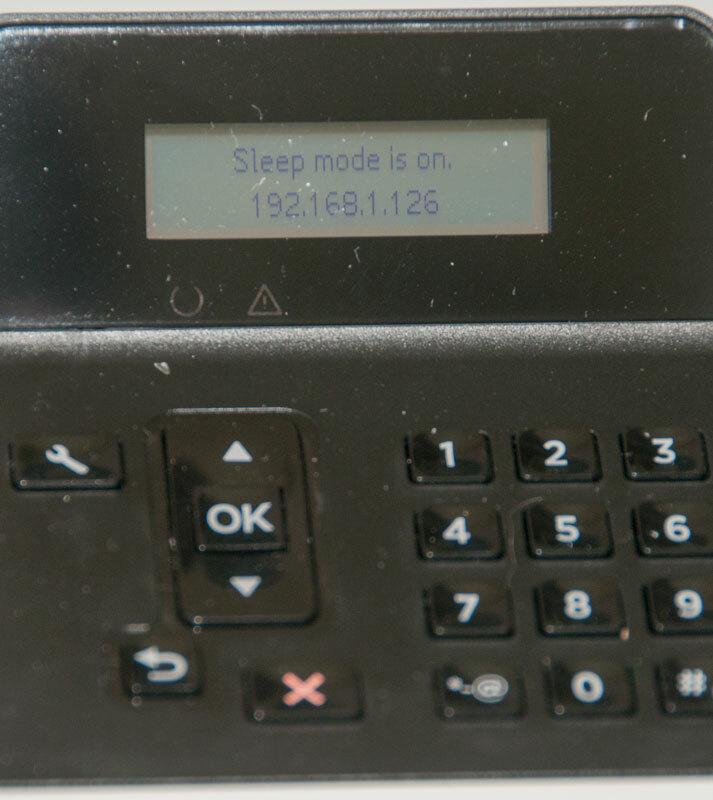 Then connected the LAN cable and pretty quickly a network address appeared on the second line, where the top line was READY and the back light was on. I did not load any software, just went into WIN7 Devices & Printers and "add a printer" and selected the HP M501dn and let the computer do it's thing. 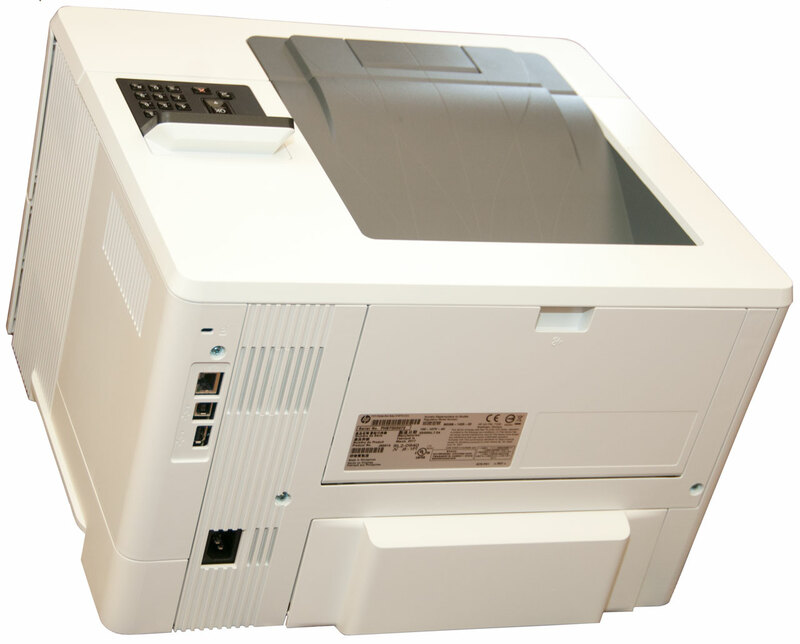 Although I set this as the default printer when testing it in SeaMonkey email I needed to manually select it from the list of available printers. 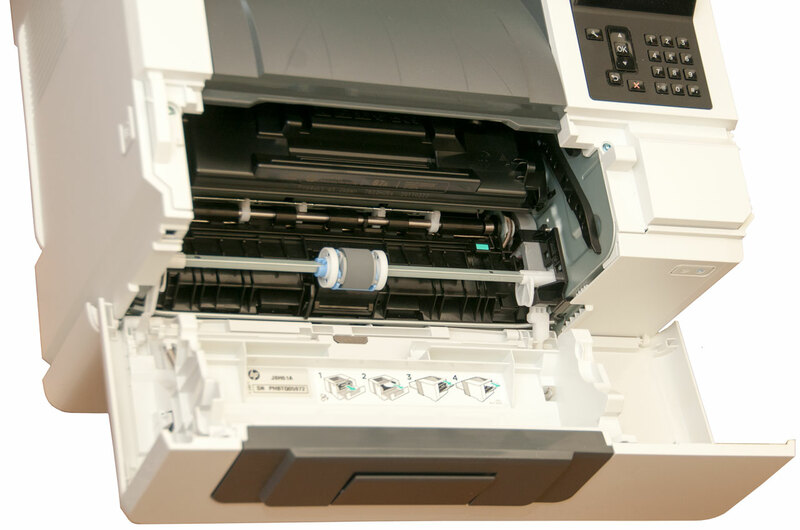 If the address of the printer shown below "READY" on the LCD is entered into a browser you have access to many printer parameters and settings. When first installed I just let my WIN7 desktop computer configure it's internal drivers and that worked for a single copy of anything I wanted to print. While busy and not paying attention to the printer, I sent a number of pages to the printer without paying much attention as to whether or not they printed. This morning (10 June 2017) I printed a single page and did not hear the printer. It usually prints within seconds of submitting something. 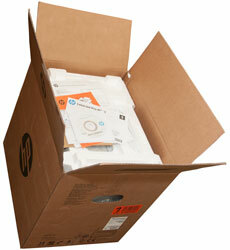 Checked Devices & Printers \ See what's printing and found a half dozen things that had not printed. 10 June 2017: (HP Support is not open on weekends) Power Off the printer and after a short wait, Power On. After the initialization process (maybe a minute) all the pending print jobs came out. 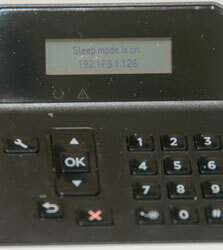 The firmware for the printer needed to be updated. 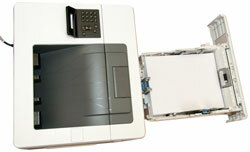 On Mac computers the printer needed to be deleted (use the - sign at the bottom of the list of printers after selecting the M501), then reinstall. Shortly after posting this problem on the HP Support Forum I received an email that looked exactly like the other emails I've received from the forum saying it was a private message and I should call an (877) phone number for support. The person who answered was in India and answered directly, there was no call screening. I asked if he wanted to use the TeamViewer, like the last HP support person, but instead had my type iexplore www.xxxme.it and started to take control of my computer, but it did not feel correct so I didn't give him authorization and hung up. Be alert for scammers who may be posing as HP representatives and only call numbers from people who have a label next to their screen name. If you think you have received a fake HP Support message, please report it to us by clicking on the blue “Report Inappropriate Content” button above the message. Thank you! This person did NOT have an HP next to their name so I clicked on the Report Inappropriate Content button. Click on photo for larger image. If cursor is (+) click again for even larger image. Hump at bottom is to make space for legal paper. Envelops printed side up, stamp end first. 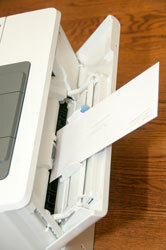 of the paper tray can be extended for legal paper. and hinge out the front panel.